Read our full 2019 Advocacy Agenda here. b. Advocate for limiting of the scope responsibilities of the School Resource Officer (SRO) to prevent minority students getting caught up in the criminal justice system unnecessarily. c. Advocate for the SRO program to be assigned a separate crime analyst to track SRO arrests and other activity. d. Investigate if SROs cooperate with Immigration and Customs Enforcement (ICE), and work to eliminate such cooperation. Advocate for outside organization like the Center for the Study of Social Policy to be contracted by the FCPD to study the discrepancy. b. Advocate for Sheriff’s Department to publish their UoF data, including the statistical breakdown by race and ethnicity. a. Contribute to ongoing FCPD efforts to improve diversity of the department. The department was roughly 15% percent minority in 2013 and it remains the same today. b. Advocate for Sheriff Department to submit the department to the CRP and IPA. c. Advocate for the Police Body Worn Camera program to be fully and permanently adopted and implemented county-wide in 2018.
a. Advocate for the reduction and eventual elimination in the disparity in arrests of people of color in the county. b. In collaboration with the Political Action Committee, advocate for the ending cooperation between the FCPD and The Sheriff’s Office and Immigration Custom Enforcement (ICE), other than that which is mandated by State or Federal law. The Office continues to voluntarily hold individuals beyond their release date at the request of ICE. ii. Part B: Panel Discussion on voting rights restoration, criminal record suppression, and ban-the-box efforts. In 2018, the Health Committee will have two main lines of effort to help ensure the residents of Fairfax County – particularly the poor and working class – improve the quality of their health. The first will be to educate the residents on the facts surrounding federal health insurance programs and benefits including the Affordable Care Act and the Children’s Health Insurance Program (CHIP). We will simultaneously advocate for local elected officials to support these programs. Our second line of effort will be to educate the community on ways to establish and maintain healthy living. a. CHIP Reauthorization – We will advocate for Fairfax County Congressional representatives to continue funding for CHIP program. importance of affordable and accessible health care for Fairfax county residents. c. Host public information forum to publicize facts and dispel rumors surrounding both the ACA and CHIP. 3. Work with the Youth Council to host a Youth Suicide Prevention and education seminar to discuss the warning signs and available community resources. 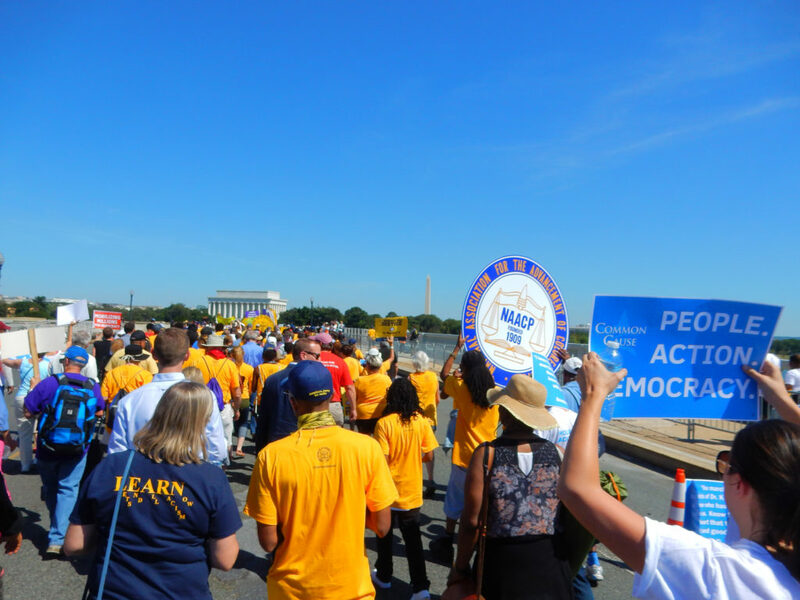 In 2018, the Political Action Committee (PAC) will continue to focus on building relationships within the community, educating our membership and supporting the NAACP on the efforts started in 2017. We will do more to turn our education into action, and increase our advocacy efforts. We will continue to highlight the importance of voting in all elections, but also stress the importance of participating in other efforts to communicate resident concerns. a. Develop and provide training/informational opportunities throughout the year to inform and encourage active participation in the electoral process. Upon request, the PAC will coordinate with committees, such as the Memberhsip Committee, to make sure registration opportunities are available at their events as well. a. Support No-Excuse Absentee Voting. We support efforts to repeal excused-based absentee voting laws. repeal of current discriminatory limits on the right to vote; and insert an affirmative right to vote in Virginia that cannot be abridged by law. 3. Encouraging Member Advocacy – Host a community information session on “Becoming a better Advocate.” The discussion will focus on the importance of grassroots organizing, community building, ways to be involved with the branch. a. Host a candidate forum(s) for to allow members an opportunity to listen to and ask questions and concerns to candidates running for local, state and federal offices, particularly those offices that will appear on the ballot in 2018. 5. Environmental Justice – Educate the community on environmental justice – particularly the disparities in how environmental issues affect minority communities. reduce discrimination at the workplace and in schools. b. Petition the FCPS to fully implement the nondiscrimination policy passed on May 7, 2015 to include Gender Identity. a. Work collaboratively with the Education and Criminal Justice Committees and community organizations to monitor and advocate for sensible laws to protect undocumented residents from profiling, unnecessary detention, involuntary child abandonment, and unwarranted ICE activities. a. Support fair bi-partisan redistricting efforts that do not disenfranchise minority communities. In 2018, the Economic Development Committee will work to enhance the capacity of African Americans and other underserved groups through financial economic education; individual and community asset building initiatives; diversity and inclusion in business hiring, career advancement and procurement. a. Work with county to investigate for the possibility of discriminatory practices by land developers, realtors and landlords. a. Encourage county leaders and representatives to engage the minority community in more pronounced way to understand our concerns with regard to economic development, empowerment and veterans’ issues, and serve as a partner for that engagement whenever possible. b. Work with Economic Development Committee on joint programs regarding the opportunity gap. c. Advocate for the Board of Supervisors to do real estate testing and litigate against companies found to be steering. b. Maintain press attention on hiring discrimination. c. Set concrete expectations, metrics, and goals in the process and continue to monitor FCPS’s progress. c. Advocate for limiting of the scope responsibilities of the School Resource Officer (SRO) to prevent minority students getting caught up in the criminal justice system unnecessarily.